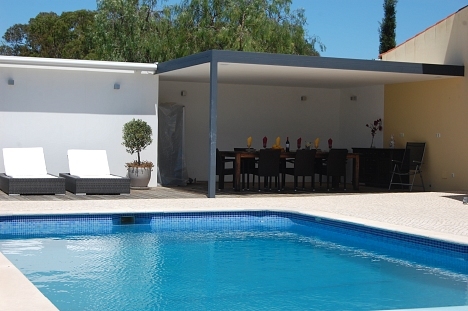 Private rental properties in the Algarve. 56 Quinta do Paraiso is a charming and brightly furnished villa which enjoys an ideal location in the Quinta do Paraiso area with a selection of restaurants within walking distance and only 5 minutes drive from the centre of Carvoeiro with its small, safe beach. Casa Mimosa is a delightful property situated just 5 minutes from Centeanes beach. This single storey villa offers a high standard of accommodation including wireless internet connection and new and modern furnishings. Casa Quinta Verde is a beautiful villa with captivating ocean views set amid countryside close to the small fishing village of Benagil. Enjoying a private location approximately 500m from the town, this property offers a degree of independence to families with older children. Situated in picturesque surroundings, this beautiful 3 bedroom villa is set in established gardens in an elevated position and has the advantage of sea views. Casa Alegria translates into 'house of joy'. This beautiful villa is situated close to Centianes beach and has recently been renovated. The property offers spacious well furnished accommodation with extensive terracing for relaxing and dining outdoors. Casa Mouraria is a magnificent Moorish style villa and does full credit to its name of 'Moorish Summer Palace'. Entrance to this stunning villa is made through wrought iron gates and calcada driveway. Set in lush tropical gardens this imposing villa has been furnished to a very high standard complete with imported Moroccan furniture to enhance the decor.